I really wasn't expecting a honey harvest this year, but the bees have been hard at work and things were starting to get a little tight for them. So we took some frames off each hive (fewer than I thought we might, but the nectar flow has been slowing down a bit). 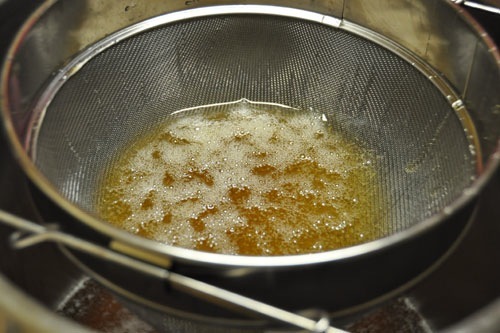 I am going low-tech and was going to crush and strain, and our neighbors had expressed interest in seeing the process, so we invited them over to watch us spread a thin layer of honey all over the kitchen. Near the end of the process they picked up the camera, so here are their love songs to the honey comb. 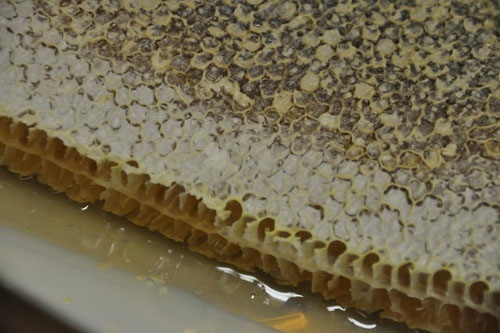 There really is something amazing and awe-inspiring about honey in the comb. Each individual cell is packed full of food. It's all very orderly and also wonderful. And crush and strain is a very visceral way of getting honey from comb. You literally smash the comb to get the honey. I like the way the honey gets an extra-waxy taste to it, but mostly I like it because I just don't want to bother with an extractor and making sure the frames are strong enough to stand up to extraction. I don't need a massive honey harvest, so forcing the bees to make new wax is A-OK by me. We'll let the honey strain out for a couple days. It's a slow process, and at the end of it we have to figure out how to bottle up honey from a big metal pot with no honey gate. Should be interesting. 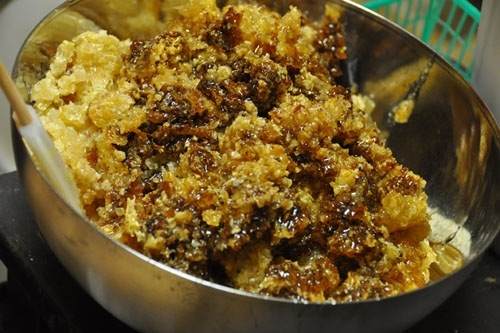 The crushed wax is sitting in the strainer now, slowly dripping more honey. Quite a bit more will drip off this wax eventually. One thing is clear: I need to get some better honey handling equipment. Minimal processing is fine, but we made quite a mess tonight and it would be good to not get honey all over everything. What happens to the crushed wax? That's for candles and such, right? Does "beeswax" have some residue of honey in it? If you don't need to replace the frames right away you could uncap (a bread knife works in a pinch) and invert the frames for a day or two. Much less honey will be trapped in the wax that way. Or you could just store it on the comb. Well, I do kind of need the frames, since the bees are getting crowded. And I've had no luck with just tipping over the frames. Maybe Alameda honey is less viscous and I should try it out, but meh. And I don't have much use for comb honey. 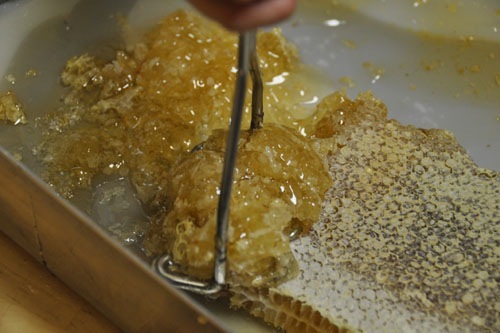 We did cut and save some nice clean pieces of comb, but for the most part we need the liquid stuff for what we use honey for. I don't know diddly about Alameda honey, but I do know that you can lower the viscosity of any honey anywhere by raising the temperature. Can't say it would be a much cleaner process though, I've used all kinds of methods and equipment--from commercial-grade to kitchenware--and extraction/bottling will always end up making a huge mess! In all seriousness, I'd be happy to let you borrow my (currently idle) honey bucket in exchange for a pound of that beautiful honey! Nate, I've been keeping bees for a long time. I used to keep them in an out-beeyard, and rent an extractor from my club to extract. During the dot-com thing I didn't have the time to keep up and I was starting to consider treatment-free beekeeping like a lot of people, so I sold my equipment and bees to a guy who I worked with a lot. This time around I decided not to spend all the money up front and only buy what I really needed so I didn't end up with a lot of stuff I never really used. I admit to being pretty surprised at how much more honey urban bees put up than rural bees. This is my first time keeping bees in a city. Very different. I wasn't expecting a couple packages to do much more than build out a solid brood nest this year, and here they are filling supers like champions. Sorry --new to the blog and the town-- I assumed anyone without an extra box or even couple of spare frames lying around was seriously wet behind the ears. That sounds like quite the experiment in beekeeping minimalism you've got going there! Well, if it will help you out any, my offer stands and I can probably loan/rent/give you whatever else you need. The urban setting is a great place to keep bees, maybe better than the country. Urban honey production is so good because city gardeners keep a wide variety of different things blooming at any given time. In my experience, the honey tends to be much lighter in character than wildflower honey. You also get some pretty odd flavor variations year-to-year. 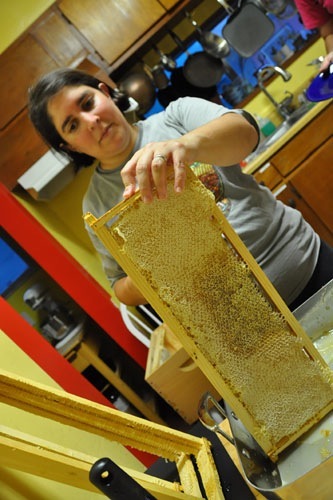 No prob, I actually have never blogged about beekeeping before so even reading the blog obsessively you would not have known my dark secret past as a beekeeper. And you're right about the honey; I got a lot of eucalyptus up in Pescadero and the honey was dark and heavy. This honey is light and flowery. If we were in a more urban place (say, downtown SF), I'm sure it would be different, but here everybody has a garden and there are lots of flowering street trees.